A look at my website will confirm I don't just shoot cars, I cover a wide range of genres. But I have shot in and around cars through my career. Early on I joined a facilities company specialising in the design and build of onboard camera systems for F1 and Motorcycle GP live TV coverage. That involved SD transmission by analogue microwave links installed in a small helicopter which was towed on a trailer all around Europe. Whilst working at the launch of Jaguar Stewart Racing, I met Steffan Hewitt, Polecam's designer, and saw an opportunity to work with this unique product. I bought one of his first Polecam rigs 17 years ago and it has brought me a career as an owner-op which is still going strong today. I suppose because of that early start a lot of what I've done has been around motorsport. Even now I work on F1 launches for Ferrari, Manor Racing and McLaren, plus the Goodwood Festival of Speed. I've been doing that now for about 8 years - the start line camera. I shoot it now with a Toshiba IKHD-1H minicam on my Polecam, at the side of the track; it's all live, fibre back to the OB truck about 1 1/2 km away with footage shown on Large screens, ITV and a live programme on Sky. Because of all this work I do get a lot of car-related bookings via word of mouth, as well as a whole variety of work on other productions. The FIA World Rally Championship (WRC) pits drivers and production-based cars against some of the toughest and most varied conditions on earth. It's widely regarded as the most challenging motorsport championship anywhere. The event I covered (and which covered me - in dirt!) 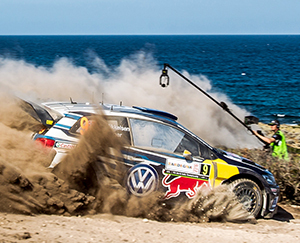 was Rally Italia, which took place on the island of Sardinia over three days. I was shooting for NEP Finland. It was shown on WRC TV and the world feed went out to many countries as well as Channel 5, BT Sport, Eurosport and motoring channels. The Polecam rig used for this event was fitted with a Toshiba IK-HD1H minicam and HD prime lens as well as a nanoFlash recorder. Getting this type of work is not down to Polecam skills alone - it's having the full understanding of how rallies work, and shooting to order for the programme from remote locations. On the first day you're given a handbook with GPS coordinates of your camera location; then a 6 am load-up in a rental car to travel to the rally stage about 120 km away. There we drove along the rally track in our Nissan Qashqai to the first position. It struggled along the track, which was incredibly full of ruts, gullies, hills and rocks. We set up with safety in mind, but I have to get the best shots possible, so I negotiate with the Rally Officials to find somewhere that's safe but will still get us great shots - not on the outside of a bend or anywhere where the rocks, or even cars might be flying. A few test shots with the safety cars, then the first car can be heard, even though you can't see it, hurtling in from about a kilometre away. I start the recorder and prepare my shot for the arrival. With the incredible speeds they are going, something like 90mph, the 300HP 4 wheel drive rally cars scream past along this very same track we struggled to drive along, lifting huge clouds of dust and throwing stones up into the air like bullets. Some of the spectators do appear to get blasted if they've chosen bad positions; some of them are wearing masks for protection from the dust. You get a couple of minutes for the dust to settle if you're lucky. The starts are every two minutes. You have one chance to get the shot. After the twenty or so cars pass, the recorded memory cards are handed to a motor cycle courier who rushes them back to HQ for the edit of that day's programme. We drive about 20 km to set up for the afternoon session. This time I had a bit more warning by way of a helicopter tracking the cars - I could see it coming into shot before the car came over the crest of the hill. With Polecam, I could swing out, develop the shot, follow the car entering the hairpin and then blasting away in a cloud of dust and stones. By the time we pack up and drive back it's 9pm. We grab some food, get the batteries on charge, and clean all the kit ready for the next day. On the Sunday a 6am start again. We drove to the live stage start, then along the rally track for about 2km, through the hills and down towards the sea; a beautiful location; the camera position was the inside of a hairpin. I rigged Polecam using 4 carbon fibre sections so I could provide a long sweeping shot and operate back from the edge of the track. We connected the camera and the audio output to a fibre box and sent the signal a couple of kilometres to the OB unit. Now we had talkback so I could hear when each car started the stage, how many seconds to when they reached camera 2; I was camera 3, so I could line up the shot and prepare for the arrival of the four wheel drive missile. The first car comes into shot and the director calls my camera. I start the move high, show the track and the car rounding the previous corner, then speed up the move and drop down low to fill the frame with the car and driver fighting its way around the hairpin just a few metres away; I continue to follow the car around as it blasts its way towards the next camera position. Five seconds later the slipstream covers us in dust that lasts for a good thirty seconds. Quickly I have to clean the lens and dust down the equipment as best as I can as the next car is about to start the stage. A couple of hours later we've set up to shoot the final stage and the cars are coming thick and really fast - the dust and dirt is just unbelievable but the Polecam controls and remote head and all the kit keeps on performing perfectly despite the extremely hostile conditions. By Mark Sallaway -Now available with 2 polecam rigs, 4K and Hi-speed cameras plus a wealth of experience - who knows where the next location will be? - hopefully somewhere without too much dust!